﻿ Thinking of Moving to Venice, FL? Thinking about Moving to Venice? Discover what living with small town charm is like. If you're considering moving to Venice and doing some initial research online, you've come to the right place. This page has been created to help give you a better understanding of the Venice area and what retirement life could like as a year-round resident in a charming small town here on Florida’s west coast. 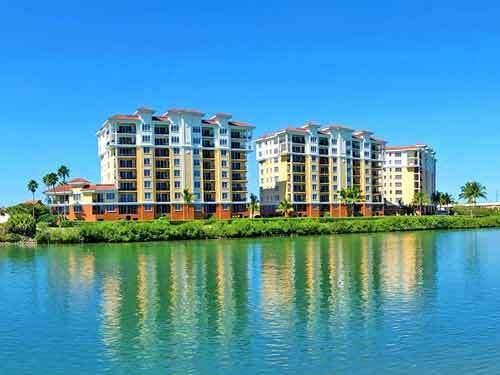 We will overview the types of amenities, activities, safety of the Venice area as well the local top-rated hospitals. We also encourage you to reach out to Julie Larson, our Venice relocation expert, as she is glad to answer any specific questions you may have about the Venice real estate market, housing prices and annual expenses when living here. 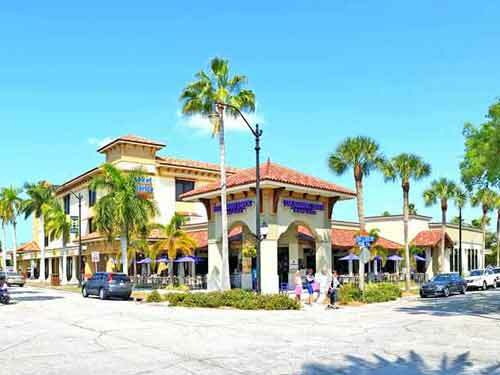 Located 18 miles south of Sarasota, Venice is a popular small-town retirement city on Florida's west coast. Venice is best known for its historic downtown area, its beaches which are lined with shark's teeth, its miles of active waterways that are a playground for boating and watersport activities as well as its jetty and its 700-foot long fishing pier which provides panoramic views of the Venice coastline. Residents of Venice enjoy a high-quality of life with a great year-round climate, affordable real estate and have access to top healthcare and medical facilities. The current population of Venice is 21,730 (Sarasota County is 379,448). Experience the historic downtown and small-town charm of Venice in the video below. Make sure your volume is on. The City of Venice commonly receives accolades and awards each year for its historical downtown, its high degree of safety, its popularity as a top Florida retirement destination as well as its top-rated healthcare services. See recent mentions below. When choosing a Florida retirement community to call home, Venice has been and continues to be one of the most desired in the entire sunshine state. With an average age of 69.1 years for its year-round citizens, Venice has recently been named as the "3rd Happiest City in America" by WalletHub (2016), the 2nd Best City in Florida for Seniors to Retire in by GoodCall.com (2017) and 7th Most Charming Small Town in Florida by Touropia.com (2018). Venice offers it large retiree population many affordable real estate choices. Whether your preference is a brand new home in a master-planned community with a clubhouse, swimming pool and tennis courts, an existing home or hi-rise condo close to the Intracoastal waterway or within walking distance to Venice Island, there are many options to look at. At the end of 2018, the median Venice home price was $241,700. To find out exact housing costs and the best Venice neighborhoods to live in, contact Julie Larson, our Venice relocation expert listed on this page. The Venice area is known for its beautiful Gulf beaches, some lined with sharks teeth. 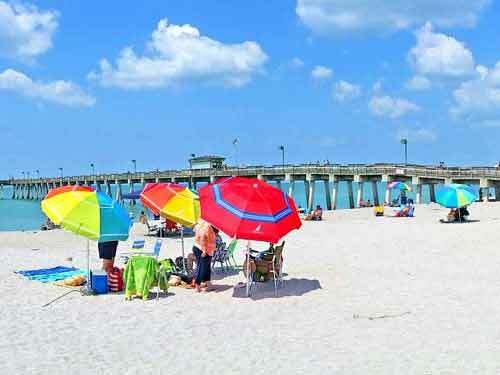 The area beaches of Venice include Venice Beach, Caspersen Beach, Nokomis Beach as well as the North Jetty Beach. Venice Beach and Caspersen Beaches are located south of the Venice Jetty while Nokomis Beach and North Jetty Beaches are located on the south end of Casey Key (just north of the Venice Jetty). Having access to quality medical and healthcare services when moving to a new area is very important. Venice's area hospital is Venice Regional Bayfront Health, which is located on the north end of Venice Island. There are also many area top local medical groups including Gulf Coast Medical Group and Venice Health Park which, is located near Jacaranda Blvd (south Venice). Venice is the perfect city for outdoor enthusiasts with its average year-round temperature of 73 degrees and 252 sunny days each year. If you’re a golfer, there are many great courses including Calusa Lakes and Waterford. 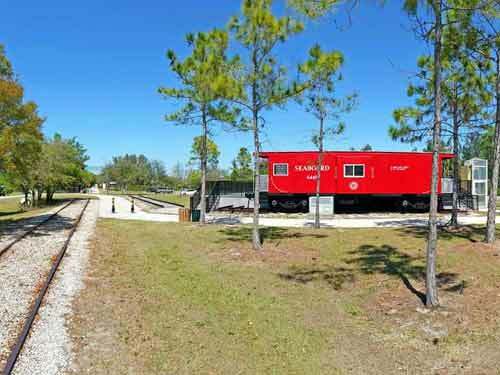 If you like exploring nature, ride or walk the popular Legacy Trail. And finally, if you enjoy being near the water, try fishing at the Venice Pier or go for a relaxing stroll at the Venice Jetty. The job and employment market within Venice has been very strong in recent years with an unemployment rate at only 3.6%, which is below the national average. Top sectors of employment in the Venice area include hospitality and tourism, healthcare, education, skilled trades, retail and professional services. The largest employers in Sarasota county include the local School Board, Sarasota Memorial Health Care (SMHC), Publix Supermarkets, PGT Industries as well as Sarasota County Government. Venice has endless options when it comes to dining choices and talking advantage of happy hour! If you enjoy waterfront dining, check out the popular Sharkys on the Pier or Dockside Waterfront Grill at Marker 4. If you feel like heading downtown for an evening, swing by the new Daquari Deck, T J Carney’s Grille & Pub, The Soda Fountain, T J Carney's Grille & Pub, Abby's on Miami or the 3 Little Pigs BBQ. Many of these establishments offer open-air seating in their outdoor sections. Endless Events to Check-Out in Venice! Venice offers its residents an active scene of events, downtown festivals and theatrical performances to enjoy year-round. There are also many popular annual events that take place each year including the Venice Art Classic, The Venice Craft Festival, The Venice Art Festival, Christmas Walk and many, many more! Retirees living in Venice enjoy an active performing arts and theatrical scene. The Venice Theatre, which is one of the largest community theatres in the entire US, has an active schedule of performances including cabarets, comedies, full-scale musicals, dramas and cutting-edge contemporary productions. "Julie did a wonderful job helping me find the right place. She is a charming and enthusiastic individual and very conscientious. She always made herself available when I needed her and searching and visiting the listings with her was fun. I heartily recommend her!" "Julie found us our dream home, 'our diamond in the ruff' as I like to call it! Julie was able to see the potential in a house I had written off the list. One step inside and I knew it was a perfect fit for our family! We got an amazing deal and we couldn't be happier. Thank you Julie for all your hard work and dedication!" The greater Venice area is comprised of five separate communities including Venice Island, South Venice, Laurel, Osprey and Nokomis. Each area has its own distinct charm and qualities. These communities have been marked on the below map for your convenience. 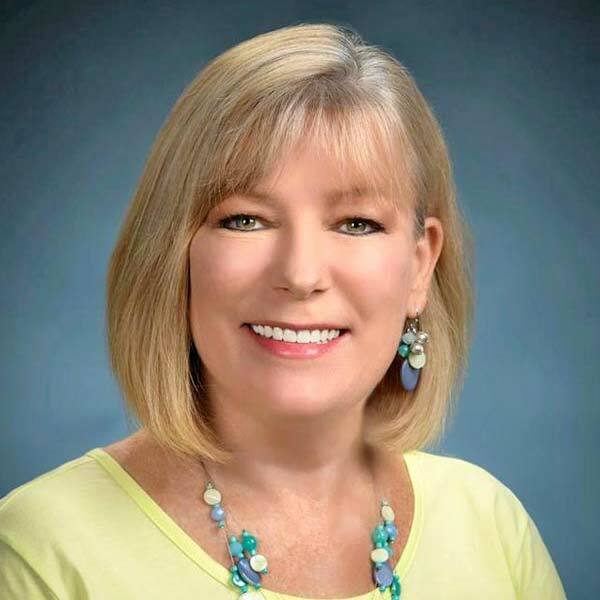 When you connect with Julie Larson, our Venice relocation expert listed on this page, she can show you the most popular residential communities and best housing opportunities in Venice that meets your needs, lifestyle and overall budget.